A selection of neolithic pendants from various Irish sites. Several pendants like these were found at Carrowmore, and can be seen in the National Museum of Ireland. A range of the type of grave goods from Carrowmore. 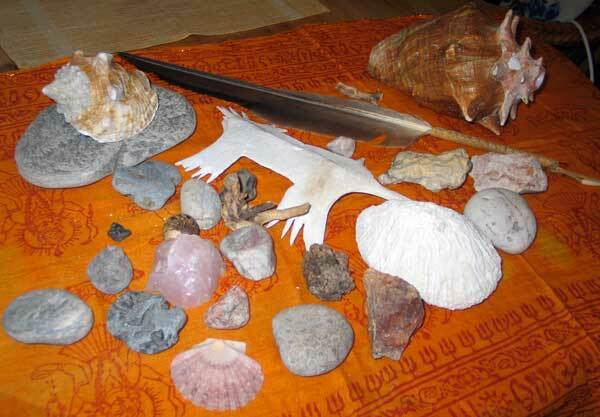 Fragments of quartz which would have come from the Ox Mountains to the south of Carrowmore. Quartz was an important feature of this type of monument, and at Carrowmore pieces of quartz were included with burials. Chert was quarried on the east side of Knocknarea, and chert scrapers were found in abundance during test excavations carried out on the walls around the mountain. Chert scrapers were discovered in several of the Carrowmore chambers. Another common find are fragments of flint, a more durable stone than chert, which would have been imported from Antrim or even further afield. A leaf-shaped flint arrowhead was found in Circle 7, while a fine spearhead or javlin was found by Walker in the chamber of Listoghil. A few fragments of the type of pottery called "Carrowkeel ware" were found, and one complete pot dating from the Bronze age was discovered in Carrowmore 17. A fine bronze pin was found in this pot, and Walker seems to have swapped or traded it with his friend Petrie, who also had a personal collection. One of the most common finds in the Carrowmore monuments were pieces of carved antler from the red deer, and sometimes pins carved from cattle or some other kind of bone. Stephan Bergh and Robert Hensey settled the question of the age of the Carrowmore monuments by dating samples of red deer antler. 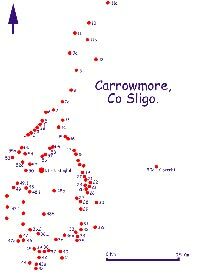 Using C14 dates they were able to prove that the period of use of the Carrowmore monuments stretched from 5,800 to 5,000 years ago. Using DNA samples they were also able to prove that the red deer had originated in France, and must have come here with the neolithic settlers who colonised the Sligo region. Another commonly found item are marbles, bead and pendants, usually with a perforation, made from of various types of stone. A beautiful pendant made from a perforated piece of rock crystal was found in Circle 4. A selection of these artefacts are on display in the National Museum of Ireland in Dublin. Cremated human remains were found in large quantities - some 32 kg came from the chamber of Circle 4 alone. Large quantities of animal bone - from many different species - were found in the chambers by Walker and Wood-Martin. These may be the remains of feasts that were held in the circles at various times in the past. Some of these lists are reproduced on their pages, from Borlase's account in Dolmens of Ireland. The Kissing Stone, Circle 7 at Carrowmore, illustrated by William Wakeman. A flat, circular ring of bone was found at Site 27. It was thought to be carved from whale bone, but is now considered to be a piece of walrus tusk. There is still a large colony of seals living on the sand flats in nearby Ballisodare Bay. Another broken artefact, similar in appearance was found at Site 1. Some samples of neolithic pottery.